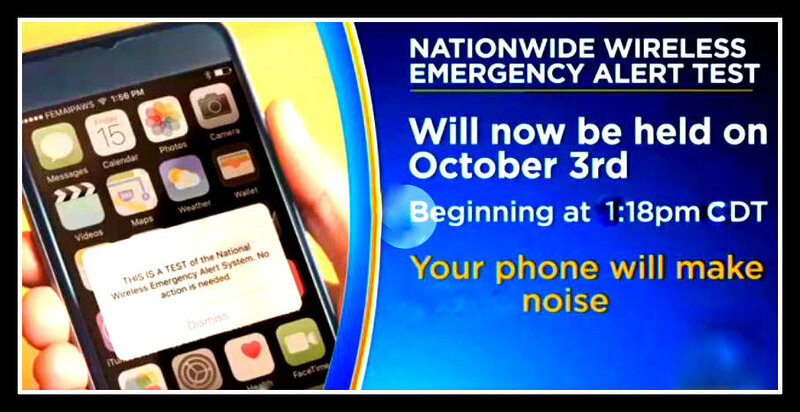 Nearly all cell phones will be sent a message on Oct. 3. School safety partners say a great teachable moment lies just ahead in the national warning system test on Wednesday, October 3, beginning at 1:18 p.m. Central Time, when nearly all cell phones will be sent a message. This first nationwide test of the Integrated Public Alert and Warning System (IPAWS) is being conducted by the Federal Emergency Management Agency (FEMA), in coordination with the Federal Communications Commission (FCC). Officials said the test of IPAWS and its Emergency Alert System (EAS) and Wireless Emergency Alerts (WEA) is intended to (1) assess the operational readiness of the infrastructure for distribution of a national message and (2) determine whether improvements are needed. The new WEA portion of the test commences at 1:18 p.m. CT, and the EAS portion follows at 1:20 p.m. CT. This WEA test message will be sent to all cell phones that are connected to wireless providers participating in WEA. Craft a customized message notifying of the upcoming IPAWS test, while also providing information specific to the school district's area. For example, schools may want to provide details about the local emergency notification systems or describe how the school plans to communicate with students and teachers during real emergencies. Ensure that messaging sent about IPAWS is accessible to those with access and functional needs. FEMA has prepared an accessible version of the announcement about this month's test that can be shared with the whole school community. Recommend that schools and school districts plan a drill or exercise to coincide with the IPAWS notification. For example, many schools are required to conduct annual evacuation drills, and the IPAWS notification on October 3 could serve as a marker to conduct this drill. If planning a drill or exercise at this time is not possible, emergency planning teams of schools and school districts can use this event as an impetus to set their calendar of drills and exercises for the school year. Share details about the need for schools and school districts to create a Communications and Warning Annex as a part of any comprehensive, high-quality school emergency operations plans (EOPs). This is recommended in the Guide for Developing High-Quality School Emergency Operations Plans. Post the fact sheet that FEMA created in English and Spanish to describe IPAWS and its EAS and WEA systems to agency Web pages and share them via social media and other dissemination channels. For more information about the upcoming nationwide warning system test, see the FEMA press release about it (note that the test was pushed back to October 3 from an earlier scheduled date). To get answers to questions about this test, or for general support with emergency preparedness planning, contact the national school safety technical assistance center, at info@remstacenter.org or 1-855/781-REMS .